Meadowbrook Parkway runs half the length of central Nassau County, in the north- south direction. 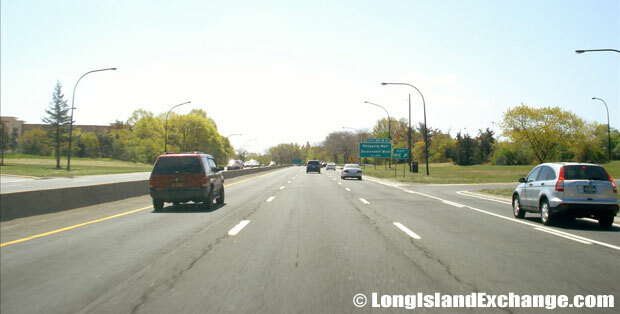 Built as an alternate to Wantagh Parkway going to Jones Beach, it begins at Northern State Parkway near its intersection with the Long Island Expressway at Carle Place. From Mineola the parkway runs south, through the Nassau HUB area, winding through East Garden City, Uniondale, East Meadow and Merrick. Here it crosses the Great South Bay onto Jones Beach State Park, where it turns east to become Ocean Parkway. No commercial traffic permitted on parkway. 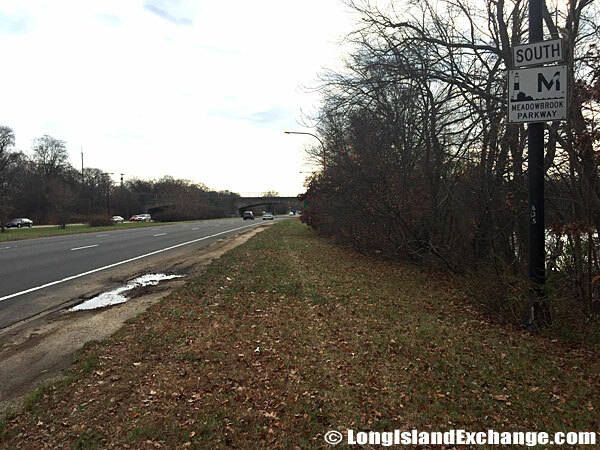 Meadowbrook Parkway hosts the Long Island Marathon during the first weekend in May each year. It serves many recreational areas, shopping malls, The Nassau Coliseum and many State Parks. Meadowbrook Parkway Northbound just South of the Southern State Parkway. Meadowbrook State Parkway was constructed to alleviate Jones Beach-bound traffic. Work began in 1932 and included the construction of the Loop Parkway spur to Point Lookout. The initial four mile long section from Jones Beach north to Freeport was a two 24-foot, two-lane roadways separated by an 18-foot-wide grassed median. The causeway leading to Jones Beach was built on fill over marsh and islands across the Great South Bay. The next section extended the parkway to the Southern State Parkway in North Merrick and completed in 1956. The roadway for two lanes of traffic each way was separated by a 29-foot-wide median. The bridges separating grades were constructed to permit the future widening of the parkway from four to six lanes, which was completed between 1955 and 1965. Meadowbrook Parkway Southbound South of Zeckendorf Boulevard. Further widening of the rest of Meadowbrook State Parkway between the Southern State Parkway in North Merrick and the Northern State Parkway in Carle Place resulted in its expansion to three 12-foot-wide lanes in each direction, resulting in the narrowing of the grassed median from 29 feet to five feet. In order to reduce the chance of accidents because of this reduction, cable-reinforced timber guide rail was installed. Meadowbrook State Parkway Southbound North of Merchants Concourse. After the parkways were transferred from the LISPC to the NYSDOT, tolls were removed for motorists using the Meadowbrook Causeway in the area of Jones Beach. 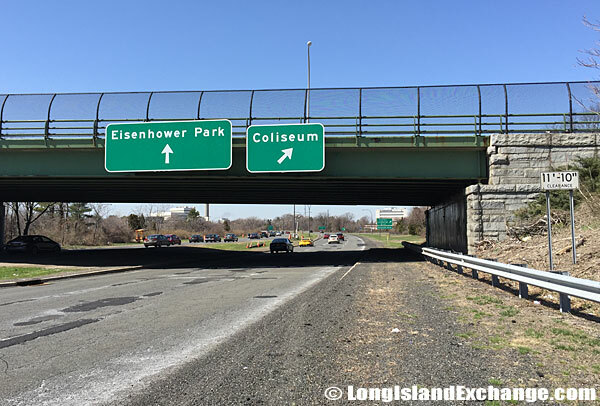 Meadowbrook State Parkway Northbound on the east side showing the exits for Eisenhower Park and Nassau Coliseum, near East Meadow. The interchange between the Meadowbrook State Parkway and the Northern State Parkway was the site of many accidents. The interchange between the two parkways was improved with the construction of new, wider main roadways and direct ramps, and the work was completed in 1992. 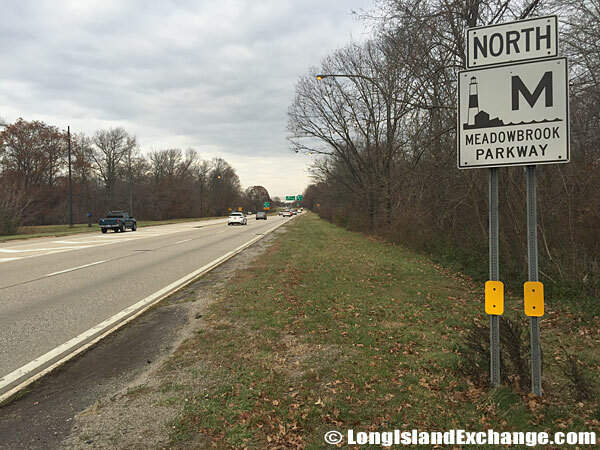 During the late 1980’s and early 1990’s, safety on the parkway from Merrick Road north to the Northern State Parkway was improved with the installation of new MUTCD-compliant signs and high-intensity lighting. More modern safety measures such as concrete (“Jersey”) barriers and sand-filled impact attenuators were installed. Meadowbrook State Parkway South past Hempstead Turnpike. While improvements and modernization is possible in most parts of the parkway, the section of the Meadowbrook State Parkway south of the Southern State Parkway is designated as a “Robert Moses National Register Parkway.” In this segment, many facets of the original parkway design, including the guardrails and landscaping, are protected. Lighting fixtures installed in 2001 are replicas of the original wooden light posts, but reflect modern design standards. Meadowbrook State Parkway Southbound North of Zeckendorf Boulevard. In 1998, the parkway was renamed the “Norman Levy Memorial Parkway”. As traffic congestion increases, plans are afoot to try to widen the parkway. For the present, HOV lanes are expected to handle the new “Long Island Rapid Commute” vehicles.